Saturday Night Live had a good recap of the week’s news. The Virginia blackface controversy is astounding. But what is also interesting is the result of a poll of Virginians about whether the governor Ralph Northam should resign. 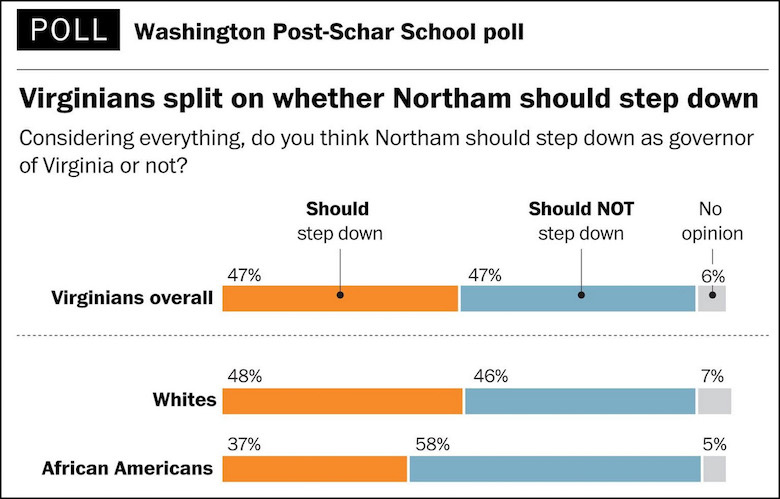 It looks like black Americans are more likely to give Northam a pass than white Americans. I am not sure what to make to make of this. Is it that they are so used to people, even those who profess non-racist attitudes, having racist pasts that they are not as shocked by these revelations and can more easily shrug such things off? Whatever the reason, it definitely strengthens his attempt to hold on to his office, an effort that seemed hopelessly doomed just a few days ago.